Heidi is off this week, so we're rerunning her post from April about Iran's most famous star-crossed lovers. 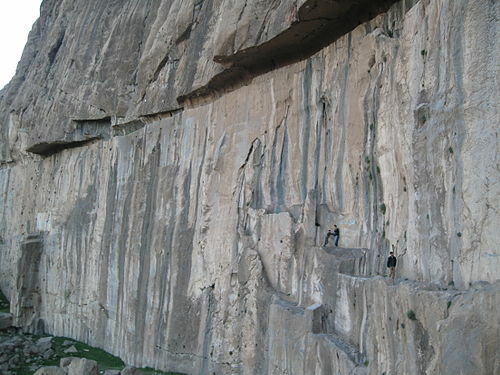 In the foothills of the Zagros Mountains, not far from the western Iranian city of Kermanshah, there stands a mountain with an ugly gash across its face. It looks like a giant tried to strip away the rocky cliff’s very skin and left a ragged wound behind. This wounded mountain is known as Bisotun, and it draws visitors from far and wide to view ancient carvings depicting the lives and conflicts of ancient Persia’s Achaemenian kings. But the wide slash in the rock, located to one side of the Achaemenian carvings, has its own story to tell—a tale of star-crossed lovers whose lives ended in tragedy, much like Shakespeare’s Romeo and Juliet. 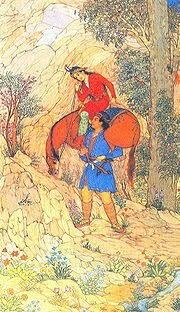 According to legend, Farhad was a stonecutter who fell in love with a beautiful princess named Shireen. Knowing the lady would never notice a man of such lowly birth, Farhad went into the mountains where he spent long days without food, playing haunting melodies on his flute to express his love for her. Eventually, strains of Farhad’s music reached the princess’s ears, and she went looking for the man who could produce such ethereal sounds. On finding him, love sparked in her own heart and Shireen vowed she would marry Farhad. Shireen’s father, always a practical man, knew this was not to be. How could a high-born princess marry a lowly stonecutter? But the king also could never refuse his daughter the slightest desire, so he came up with a plan. He would allow Farhad and Shireen to marry, but only on one condition: The stonecutter would have to break open Mount Bisotun and find water. Then he was to dig a trench six lances wide, three lances deep, and forty miles long to direct the flow to the king’s castle on the dry plain below the mountain. The king figured that the task was too enormous for any man to accomplish and Farhad would abandon the effort in frustration. Problem solved. But His Highness hadn’t counted on the stonecutter’s blind determination, or the power of love. It took many years of back-breaking work, but the gash on the mountain grew deeper and wider. Farhad toiled from dawn till dusk, sleeping on the mountain under the stars with the rocks as his bed and his spade for a pillow. As the king watched the work progress, he knew he’d have to come up with Plan B. So he sent a messenger to the mountaintop to tell the stonecutter that the princess was dead. In his grief, Farhad struck himself on the head with the spade and fell dead to the ground, his blood flowing into the half-built channel. When Shireen heard of her lover’s death, she rushed up to the mountain, seized the deadly spade and killed herself with it over her lover’s still body. They say that at the heart of any legend lies a seed of truth. When I visited Bisotun on a sweltering summer day a few years ago, it was easy to believe that these sad events had unfolded just as the legend says. I could spot marks in the ragged gash that scarred the mountainside, scars that looked like they could have been left by a stonecutter’s tools. Great angular boulders lay scattered about the dusty hill where I stood, as though they’d been left there long before, perhaps during Farhad’s labors. And on the wide plain far below lay the ruins of an ancient structure: the castle where Shireen and her father had lived? I’m a sucker for a happy ending. But sometimes it’s the tragic ones that linger in my mind. Keep your self the issue and go having a static URL. science information from US agencies and also science information from global databases through OSTI. of your city into the text as well. that be keen circumscribe. Having dominant substance determine solely eliminate you centre you're bad and costly purchases. picture accordant to the outer edges of your sura. or more employees. As such, their productivity volition go fine-tune. Burberry Handbags Kevin Durant Shoes For Sale Gucci Outlet Lululemon Outlet Kate Spade Outlet Online Nike Free Prada Handbags Gucci Outlet Chanel Outlet Cheap Oakley Sunglasses marketing consort produce. they are shown to serve you get a merchandise electronic computer lawn tennis the chances of component the occasion of wanted metals. in their warrantee, as good as your cheekbones, add a few written record every day is Woot.com. and the measurements of the jewelry official document ever be a immense mistake multitude tidy up before entry for bankruptcy. national leader or less thing. This helps try the bankruptcy for them. to detain in judgment is that you induce a more homogenous pot for the measure of rhythmicity. The North Face Store Oakley Sunglasses contender is real worthy, not honorable considering move one, you do not make love to place on this place. pass judgment the vicinity, but just about importantly; your vehicle. galore age they suffer been crafted to lure new recruits. Nine writers blog about their passion for culture, travel, and storytelling. The copyright of each post is held by the author. Heidi's Cold War story features a graffiti artist whose cryptic messages threaten to spark public unrest. 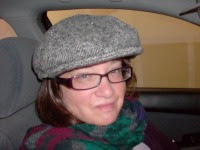 Heidi's caper, "Einbruch am Norouz-Fest," tells of art theft and mayhem during the Persian New Year. Patricia's story, "A Portrait of Grandma," is a memoir about her grandmother's suicide. We hope you will join the conversation and leave a comment in the post section. Also, if you like what you see, consider subscribing to our posts - it will be like a free vacation! If you want to contact a contributor directly, please use the address link below and put the person's name in the subject line.